On this weeks Go Creative Show, host Ben Consoli speaks to Greig Fraser ASC ACS. 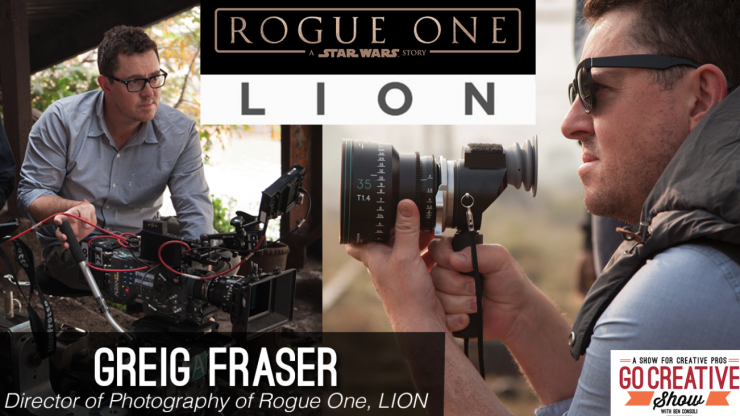 Greig is the visionary director of photography for two of this years most talked about films, the mega-hit and stunningly shot Rogue One, and the beautiful and heartfelt film LION for which he won the prestigious Camerimage’s Golden Frog. On the surface these films are drastically different, but Greig considers them surprisingly similar and shares some of his lighting and lensing choices to prove it. Greig and Ben discuss the challenges of shooting in India, the Arri Alexa 65, the benefits of vintage lenses and why he used the Digital Sputnick LED light on both films.